No clips, no glue, no tape, no damage, this is our latest 613 flip hair extensions, which are completely made with real Brazilian human virgin hair. The extensions has three options in size of 14, 16 and 18 inches. Every package weighs about 100g. Flip hair extensions is the easiest way to apply, you only need no more than 30 seconds to attach that extensions on your head. 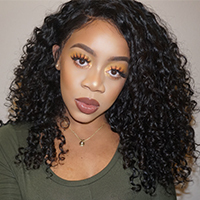 This halo hair extensions features an adjustable transparent wire, every customer can do it by themselves and will instantly get longer and thicker hair. The extensions will sit on top of your head like a halo, adjust the miracle wire according to your head size and mildly shake your head without worrying it come off. silky hair Review by Dianna P.
Very nice, quickly came, love it very much and easy to use.